Last week I attended a party given by Atelier Cologne in celebration of its third retail destination. The beloved brand founded by Sylvie Ganter and Christophe Cervasel can now be found in Brooklyn on Atlantic Avenue. Attendees sipped on champagne, nibbled on small bites and sampled a growing collection of superb fragrances. Up until a few years ago, many thought Brooklyn was too far of a trek to be taken seriously. While that perception has changed in a big way, I was intrigued by Atelier’s decision to expand its retail concept into Brooklyn. At the first opportunity I had to speak with Gerard Camme, President of Atelier Cologne, I asked him about it and he flat out said, “why not.” He further explained, “We like to go where our client is. Our client is very fashionable, smart and worldly. They want to be a part of something different. That client is in Brooklyn in a big way.” Sounds like Brooklyn to me. This is Atelier’s second store in New York. 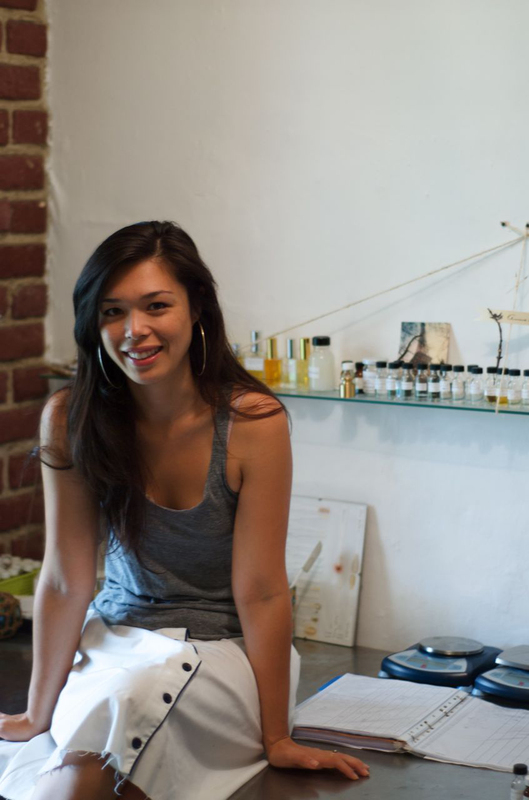 In August of 2011, they opened their first store in Nolita at 247 Elizabeth Street. In December of 2012 Atelier opened its first Paris boutique at 8 rue Saint-Florentin in the 1st arrondissment. Future store openings are planned in Shanghai, Hong Kong, Dubai and San Francisco. 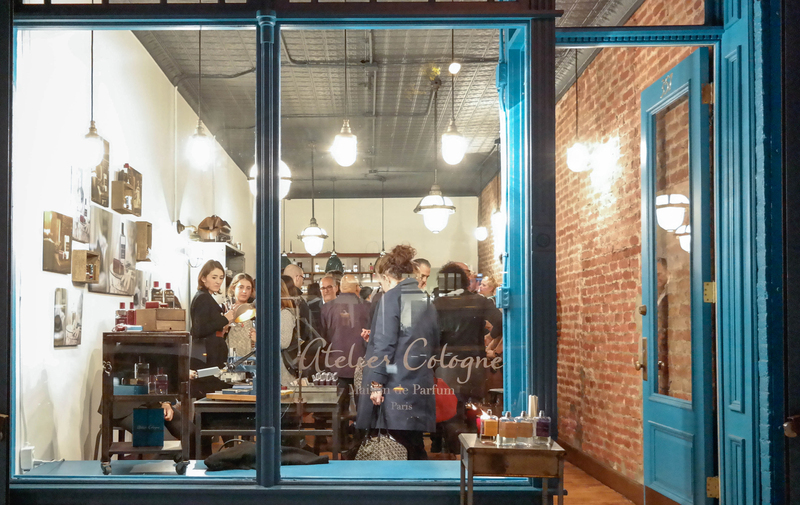 Atelier Cologne – 357 Atlantic Avenue between Hoyt and Bond streets. “throughout March 2009, Bond No. 9 invites everyone—amateurs and artists alike—to join our Brooklyn Bottle Design Competition and create additional visuals for this contemporary male-oriented cardamom-cedarwood eau de parfum. Any style, figurative or abstract, is fine with us. Inspiration can come from anywhere in Brooklyn—DUMBO, Park Slope, Flatbush, Canarsie, Midwood, Bay Ridge, et al.—or from the very idea of Brooklyn. Any medium is okay: oil, acrylic, watercolor, house paint, pastel, crayon, Magic Marker, makeup—even a ballpoint pen or pencil will do. Completed designs should be submitted to contactus@bondno9.com or Bond No. 9, 9 Bond Street, New York, NY 10012 by March 31, 2009. After our two winners are chosen in early April, we’ll put the victorious designs into production, with the winner’s names displayed on the bottles. Each winner will also receive one bottle of Brooklyn per month for a year. I am a born and raised Brooklynite. I’m one of the many that screams out in the party when the DJ asks, “Is Brooklyn in the house.” Every time someone mentions they’re looking for an apartment, I recommend Bk. Why, because its a borough rich with history, culture, food, multitudes of people, etc., etc. The borough has made me who I am and I’m so proud of that. So when I heard Bond No. 9 was launching a fragrance called Brooklyn, I couldn’t have been happier. I recently received my press kit with all of its literature and my sample, but I had to sit with this and really let it do its thing. I respect Bond and love many of their scents but if you’re going to rep for Brooklyn, I really wanted to see what they were going to come with. Let me start by saying I am not a fan of the bottle’s grafiti design. Brooklyn is gritty, for sure, and that sort of expression is part of the boroughs history; but there’s so much more beauty that represents its character. What would be cool is if they commissioned some Brooklyn-based artists to design some limited edition bottles with proceeds going to local charities. At first, I wasn’t quite sure how I felt about the scent because of its very distinct nature. However, as I sat with it, it grew on me and I realized how much I appreciated its composition. Its very earthy and up front, I really pick up sweetness with grassy and leafy notes. That can be attributed to the Juniper Berries, Guaiacwood and Geranium Leaves. But the body of the scent is nicely rounded out with woods, namely Cypress Wood and Cedarwood. What comes to mind for me as the scent nestles in are mossy wet woods and the sound of rustling leaves that saturate the air of Prospect Park. The earthiness and strength of this scent makes me wish I had a yard to rake. I find the scent to be extremely masculine but not in a traditional, bravado kind of way. There is virility here in a classic sense, i.e. men work with their hands. But it also possesses a softness to take off the edge. I can really see how a woman could really take to this on a man because it has a natural feeling about it without being overly perfumed. Brooklyn by Bond No 9 will be in stores in March.